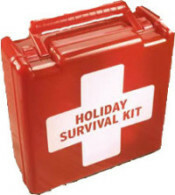 Last week I posted Home Business Holiday Survival Guide over at About.com. While this article focused on home business owners, telecommuters, freelancers and anyone working at home can benefit from the five tips that will allow them to take time off to enjoy the holidays. Even if you’re worried that by not working, you’re not making money, you’ll want to check out these tips that can help you keep your income up and yet take time for family. Enjoying time off is important to keep your energy tanks full and attitude positive. Read Home Business Holiday Survival Guide.